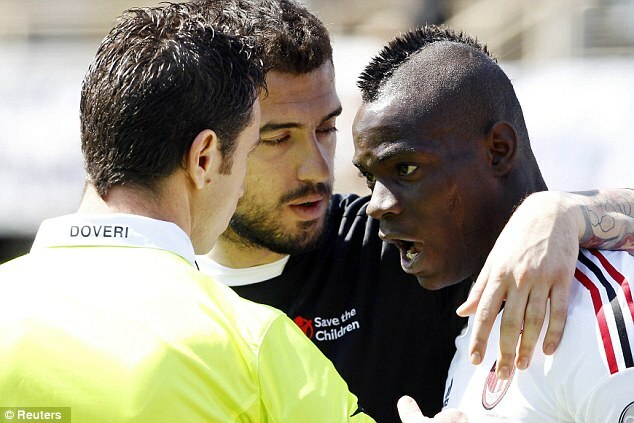 AC Milan striker Mario Balotelli has been suspended for the next three Serie A games after insulting a match official against Fiorentina on Sunday. Balotelli was already automatically suspended for one match after picking up his fourth booking of the season in the 2-2 draw. However, another two matches were added to his ban on Tuesday for insulting one of the assistant referees at the end of the game. 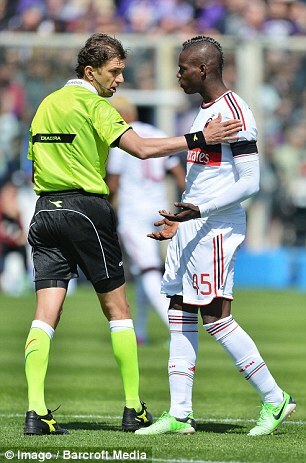 The incident comes after Balotelli was caught having a crafty cigarette in a train toilet. The former Manchester City player has scored 10 goals in 11 games for club and country in 2013, but will miss Milan's crunch matches against Napoli and Juventus as well as the visit of Catania. Milan sit third in the Italian Serie A, four points behind Napoli in the fight for second place and a direct Champions League berth, with Juventus having opened a nine-point lead at the top.